The Tiffen 3 x 4" 1/2 Low Contrast Filter works to lessen contrast across the image by creating a small amount of controlled flare near highlight areas. This enables greater detail to be attained in shadow regions, while unaffecting the values of highlights, in order to produce lower apparent contrast. 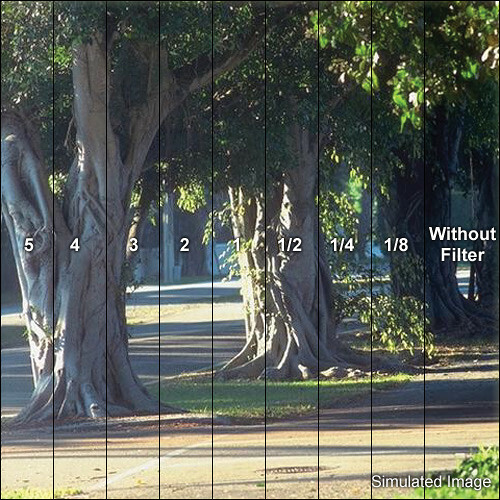 This filter is ideal for use during midday and other high contrast lighting situations when it is difficult to control both overexposed highlights and underexposed shadows. The 1/2 density provides less contrast adjustment than the 1 density, but more than the 1/4 density filter. Tiffen filters are made using ColorCore technology, a process that involves laminating the filter substrate between 2 pieces of optical glass and grinding flat to a tolerance of 10,000th of an inch. This filter measures 3 x 4" / 76.2 x 101.6mm.